Idaho is the 14th largest state in the United States, larger than all the New England states combined. The state is famous for its potato crop but some folks know Idaho as the "Gem State" because you can find almost every type of recognized gemstone somewhere in the state. The 1,584,985 (2011 estimates) population is spread across 83,570 square miles of landscape. Evidence has been found that dates the earliest human habitation of Idaho to about 14,500 years ago. 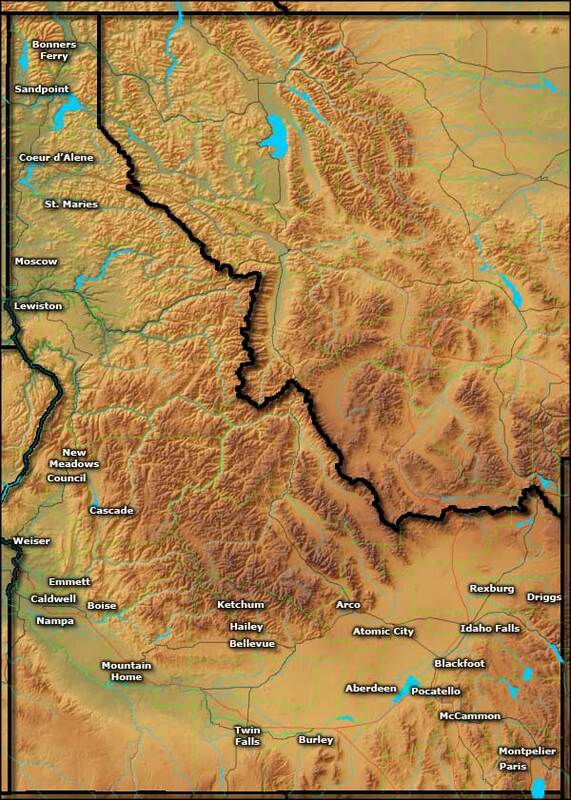 We have no idea what happened with those ancient folks but when the Euopeans arrived, most of the area was occupied by the Northern and Western Shoshone and Bannock tribes in the south and the Couer d'Alene and Nez Perce in the north. The first Christian missionaries arrived in 1836, establishing a Protestant mission near Lapwai among the Nez Perce. In 1842 Father Pierre-Jean De Smet attived near Lake Couer d'Alene and began his mission, eventually building the Cataldo Mission that is now the oldest surviving constructed building in Idaho. This was the earliest days of the Oregon Trail, a route followed by thousands of people headed west to Oregon in search of a better life, and also to help solidy the American claim to Oregon Terrory. Until the early 1850's most folks just continued on across Idaho to Oregon, stopping only to camp at night. THe Mormons of Utah attempted their first settlements in Idaho beginning in 1855 but nothing lasted until they settled at Franklin in 1860. At that time they believed they were still in Utah but a national survey in 1872 fixed the state line where it is now and many of the Mormon settlements around Bear Lake and in the Upper Cache Valley found themselves in Idaho. 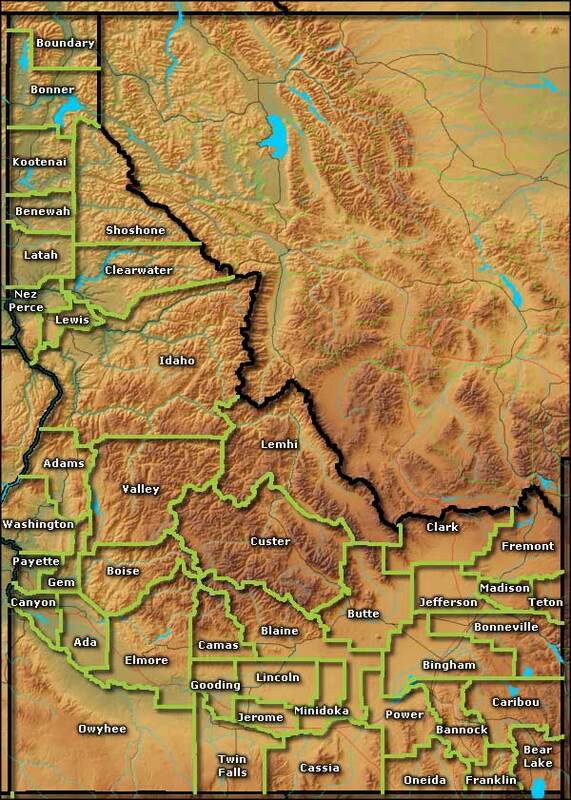 1860 also is the time of the first gold strike in Idaho, near Pierce in the Clearwater River drainage. Within a few years the population had boomed and other strikes were found. The end of the Civil War brought in a flood of new homesteaders. Then the end of construction on the Transcontinental Railroad released a lot of Chinese laborers into the general workforce. Many came to Idaho to work in the mines but the citizens resisted, passing several pieces of anti-Chinese legislation specifically designed to force them out of the state. Idaho became a state in 1890. Large-scale mining operations had spread across many mountainous areas in the state and after statehood, a shooting war soon developed between the companies and their guards and the quickly unionizing miners. Several of the mines were blown up before the National Guard intervened, occupying several mining areas and locking up every union member/sympathizer they could find. The whole thing culminated in the 1905 assassination of former Governor Frank Steunenberg (who had been elected on a pro-labor platform in 1898 but sided with the mine owners to put down a union uprising in 1899). The Idaho National Laboratory was established in 1949 on an 890-square-mile reservation in the barren desert area east of Arco and west of Idaho Falls. The property was used for research and development of nuclear power with more than 50 one-of-a-kind nuclear reactors built and tested. Only three reactors are still active but the facility is still in the forefront of research and development of the Next Generation Nuclear Plant. Researchers are also in the forefront of development of hybrid and pure-electric automotive vehicles. For many years a large part of Idaho's economy revolved around timber and lumber products. These day, that has shifted to science and technology with plants to make semiconductors and semiconductor products, computers, displays, laser printers and other digital products scattered across southern Idaho. The women's clothing retailer "Coldwater Creek" is headquartered in Sandpoint. United Airlines and Continental Airlines both trace their roots back to the Varney Air Group that operated out of Lewiston for years. Idaho's personal income tax ranges from 1.6% to 7.8%. The state sales tax is 6% and local options are limited to making that peak at 6.5%. Food is taxed but prescription drugs are not. Lodging taxes vary by locality and generally run between 7% and 11%. Idaho also runs a state lottery, the proceeds of which mostly go to support the state's school systems. There are five Idaho Casinos, all located on Native American reservations scattered around the state. A couple of the Indian casinos are relatively small while a couple are full-scale destination resorts.